Welding Boots and What To Get! Want A Good Pair Of Welding Boots? Get a quality pair of welding boots because if you skimp out and buy cheap work boots you are risking a third degree burn or worse. Your boots should not be low cut, and you should get welding work boots that have a tight fit so that nothing can slide inside, burning you. But the most important aspect of welding boots is comfort. There is nothing worse than getting blisters and aching feet from cheap welding work boots. The fact is, you are going to be on your feet a lot, and if you have cheap work boots you will get short term and long term physical problems. 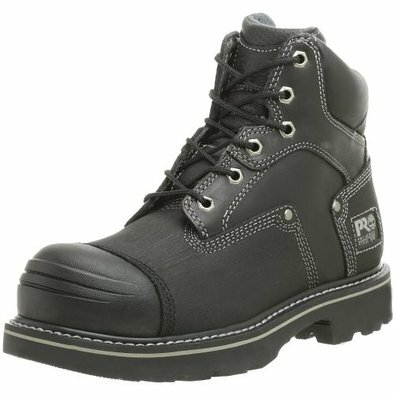 What Boots Do Most Welders and Metalworkers Wear? In the past, some of the the most popular footwear for welders were Red Wings. They are comfortable, and durable. And you can't go wrong with them. However, there are many other brands that are as good or better. But be careful not to get the cheap boots. You'll go through several pairs of cheap welding work boots before you even need to consider replacing a good pair like these. Comfort is the secret because a comfortable pair of welding boots will keep you from getting backaches, blisters, and burns. Period. And Red Wing boots are the ones for you. 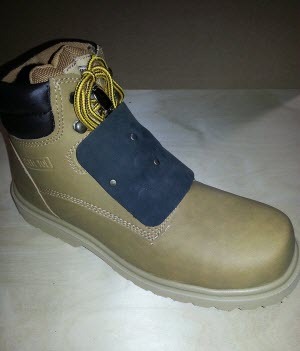 Steel toe boots are a favorite amongst welders and ironworker's. The reason steel toes are sought after is because the steel toe is added protection from falling heavy material, and slag. 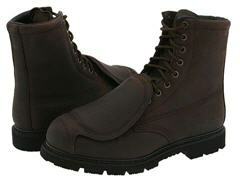 These Timberland steel toe boots are a good bargain. However, they do not have lace protection like the Dr. Martins above so you might want to get Lace Savers. These low cost boot accessories are worth it because they will save your laces from slag and getting sliced and diced in your shop. A good set of work boots are heat and cold resistant and don't scratch easily when tie wire or sharp piece of metal tries to slice them up, and the leather handles the molten slag well. I read somewhere that using silicone caulk on threads on your welding boots keeps the threads from burning from weld splatter . That's good advice I never thought of so use it. You get what you pay for these days, more than ever. So don't spend time shopping around for a cheap pair that appears to be the same because you'll end up kicking yourself later. Buying a good pair of welding work boots will actually save you money of the long term! Another piece of advice when it comes to welding work boots is to get a pair of inserts. Get a pair of inserts with an arch and padding and you'll feel like you can work all day.